How fun! Erin is the guest host of the challenge this week and she is raising awareness and donations for "Relay for Life". 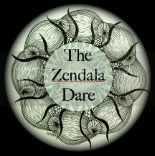 She has given us a new zendala template to work with this week and as I have found her templates to be fun and an exercise in exploration I know you will all enjoy giving this challenge a try. Thank you Erin and Laura for this challenge. Erin, we have our relay in the month of June and it is a wonderful way for all to remember those who have lost their battle with cancer and to celebrate those who have been able to beat the odds. Just trying to get a feel for the dare.....in a hurry so will try more later. I can't believe it but this is challenge 80....how I love Monday! I love the pattern so much... and everyone uses it so beautifully, it isn't easy for me and I am going to enjoy exploring it until I find a way to work with it the way I want to. Thank you Laura for the challenge! This template gave me food for thought and more thought and this is what the thought produced. Head over and enjoy this template. I am excited to see what others do with it. Erin's was fantastic! Recently I have used challenges to fulfill my tangling need. This morning I just sat down for the fun of it and it was so fun to tangle mindlessly putting lines on the paper.....so relaxing! I love the Olympics and everything about it, however, my zentangle mind struggled with this challenge. I have been trying all morning......and the sad thing is that the two challenge responses I have seen are fantastic.....so for this one I will keep trying but I think I might have met my match. We were given this challenge by Rho Densmore , a guest challenger, and I have to applaud her tiles and her sense of challenge. I will not give up Rho! Head over to the challenge at the diva and find out how wonderfully Rho tangles! It just was brought to my attention that I switched the red and green rings.....oh... do you think anyone would accept the excuse of color dyslexia? It wasn't on purpose, please forgive. At least I was consistent in my mistake. At first I was baffled and now I am so happy I kept trying. It is a fun dare and you will find it here. Weekly Challenge #78: "New Official Tangle: Auraknot"
So I knew this one was coming and yesterday I spent a lot of time playing with auraknot just to try and get the hang of it. It is a bit elusive for me. I have watched the tutorial a bazillion times and I still find that what looks so easy for Maria and Rick and for me it just doesn't come out as beautiful even when I try to follow along. Then again, when did I ever get my zentangle to look like theirs....and so I guess I am okay with that. I keep trying to tell myself this is not about becoming someone I so admire....it is about discovering myself in zentangle. That is why I love this art form so much. This morning I made the three tiles you will see in the first photo. I will keep adding and leave the ones I did yesterday on the bottom. Staying true to the challenge I wanted today's to be after the challenge was issued. Head over and play with auraknot, it is really fun. I am excited to see what you share! Using heat map app in picasa..... sometimes the photo just doesn't work and I do some editing! Another one from challenge day! Playing with paper,now that is something I haven't done lately. My favorites are tracing paper, I bought a whole roll once thinking it was something else, scrapping paper, and mulberry. I only have one piece left of the mulberry so I am waiting for a sunbeam. I will trace the pattern at the window. My first attempt is the tracing paper. I love how it looks when you place it over another surface or at a light. This morning it was over a blue mat that happened to be on my dining room table. Thanks to Erin.....I love the challenges and all you do for the zentangle community! Be sure to head over there and enjoy the challenge yourself! Though it doesn't look like either, I used my Christmas Cactus and my Hoya for inspiration. Mulberry paper, and textured lines.